Still young, Winter 2019 has a story to tell: There’s good cold, and there’s bad cold. “Bad cold” is the stunning effects of the polar vortex that has enveloped the North American Midwest this week, shattering record-low temperatures – 75 degrees below zero Fahrenheit wind chill in Chicago! – and bringing life nearly to a standstill from North Dakota to Illinois and Michigan. On Wednesday, six states in the U.S. were reporting temperatures lower than those being reported at the South Pole. Now, that’s polar. 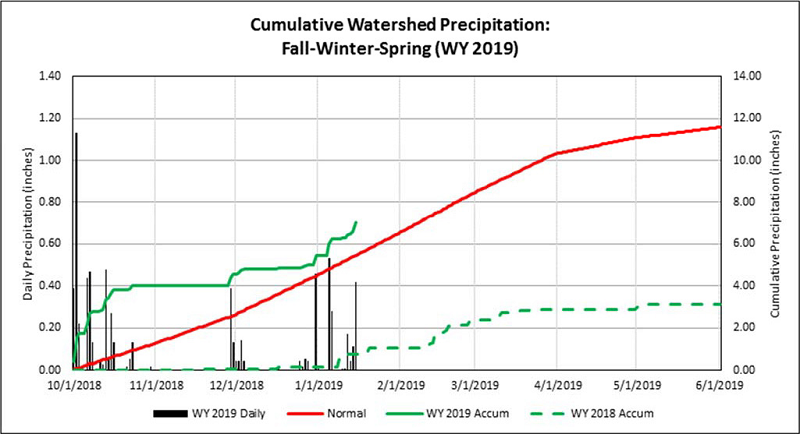 A series of storms moving through Arizona in the first two weeks of January significantly added to the mountain snowpack at the highest elevations of the Salt River Project’s watershed, despite the relative warmth of the storms themselves. 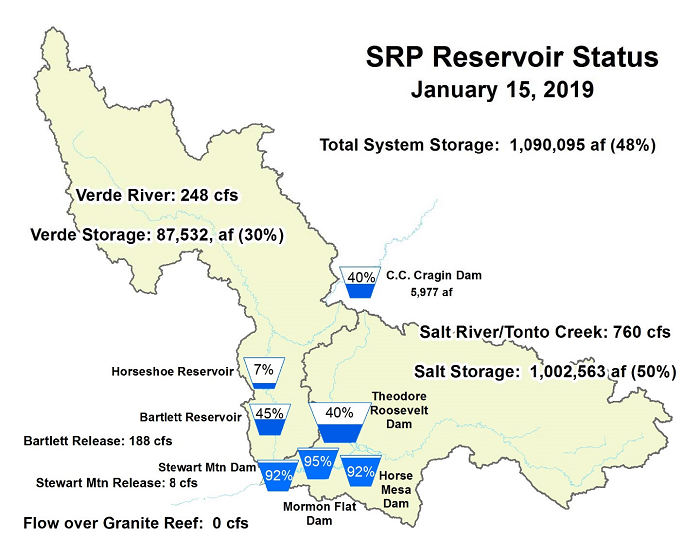 As reported by Salt River Project, elevations with a stable snowpack (generally, those above 8,000 feet in elevation) stand at 94-123 percent of normal as of January 16. The data come with lots of caveats. The areas measured at Arizona SNOTEL sites tend to be in areas typically favored for snow accumulation and are located at relatively higher elevations. Also, overall snowpack decreased as measured across the system during the first weeks of January, again because of the warmth of the storms. Still, modeling and data assimilation suggest that thanks to the high snow levels in the higher elevations produced by the three early January storms, the watershed snowpack has been deemed “slightly above normal,” a far cry from last winter’s nearly non-existent snowpack. As a result of the storms, streamflow along the Salt River has increased substantially – from a low of 120 cubic feet per second to a current flow (as of mid-January) of 760 cfs. Verde River streamflow, meanwhile, has held steady through the beginning of the year at 248 cfs. 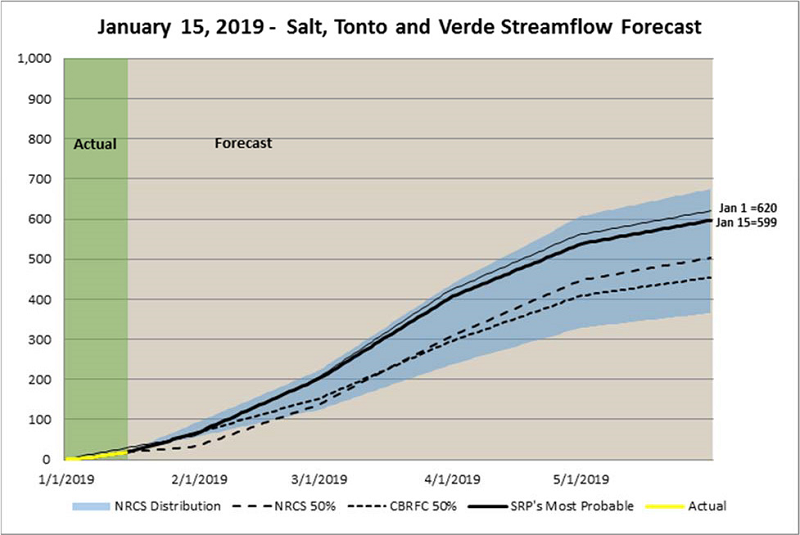 Overall streamflow for the balance of the winter is “still anticipated to be near median,” according to SRP’s Streamflow Forecast Summary Report for January 15 – May 31. Even though the latter part of January has proved drier than earlier weeks, the “antecedent soil moisture conditions are now moist enough to efficiently produce runoff with more precipitation” – a good sign for the system’s reservoirs. Reservoir storage levels in the SRP system, of course, constitute the “money” data. Currently, Roosevelt Reservoir is projected to increase from 40 percent to 60 percent of capacity by May 31. The reservoirs on the Verde River system, meanwhile, are projected to increase from the current 30 percent to 61 percent of capacity by that date.